WATERTOWN - "Gutenberg! The Musical" is just about as goofy as it gets. Well, with a title like that, it had better be. "Gutenberg! The Musical" does, of course, know that it's goofy. The show, which creators Scott Brown and Anthony King say began as a joke, is now a full-fledged, two-hour, choreographed joke: a perfectly silly, often amusing musical about a perfectly terrible, so-crazy-it's-funny musical about the inventor of the printing press. So it's not just the German setting that occasionally calls to mind "The Producers" and its deliberately dreadful show within a show, "Springtime for Hitler." But whereas Mel Brooks's producers were intentionally staging a flop in hopes of ripping off their investors, the young and painfully earnest Bud and Doug of "Gutenberg!" believe they've written the greatest musical ever. 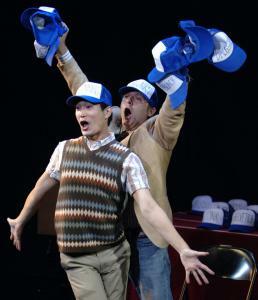 And so they are simply thrilled to act it out for an imagined audience of potential backers, playing and singing every role themselves with nothing but labeled baseball caps to differentiate the parts. The black-box setting of Downstage @ New Rep is more than adequate for the show's production requirements: a piano, a few lights, and a table to hold all those hats. It's all funny enough, though it could just as easily have been a 10-minute sketch rather than a full-length play. Brown and King lard the lyrics with plenty of wordplay and amusingly tortured rhymes, create a love interest whimsically named Helvetica (yes, after the font), and take a few well-aimed jabs at the pretensions of a certain class of Broadway musical. Musically, they know how to parody everything from rock anthems to boogie-woogie, with stops at gratuitous novelty numbers and goopy love ballads along the way, and musical director Todd C. Gordon handles all these styles with aplomb. But the show also needs a couple of sharp performers and a director with a sure sense of pacing to keep it from sagging as it goes along. Fortunately, the New Repertory Theatre company has all of these. Director Stephen Nachamie choreographs the musical numbers with particular wit and a fine eye for wackiness. Just check out the chorus line, with a clothesline full of caps to represent all the kick-stepping characters. Brendan McNab and Austin Ku, who've both demonstrated serious singing gifts elsewhere, here also draw on their great talents for comedy. McNab makes Bud a touchingly awkward, eager composer, while Ku makes book writer Doug's thinly veiled crush on Bud feel like more than the running gag it's written as. Their characters' shared exposition of the play's elements - "But what is historical fiction, Doug?" "It's fiction that's true!" - is all the funnier for their absolutely deadpan delivery of it. As for their musical performances, Ku is delightfully, wackily sincere as Gutenberg and hysterically hysterical in his turn as the lovelorn Helvetica, while McNab channels Jack Black and Meat Loaf in his rock-anthemic portrayal of the obligatory bad guy, a monk who wrecks Gutenberg's first press to keep his illiterate flock under his thumb. And don't let the silliness fool you: These guys have to do some real singing here, and their ridiculous performances would not be half so funny if they weren't also highly skilled. The world didn't exactly need "Gutenberg! The Musical." But now that we've got it, we can be grateful - especially in these grim days - for a show that just wants to make us laugh, and succeeds.